They say that time flies when you are having fun, and they are right! Three years ago, back in the summer of 2015, we hit the ‘publish’ button on our very first PHE Screening blog post. At the beginning it is fair to say that some people doubted the wisdom of replacing our previously published newsletters with a blog and there were a few who took a bit of time to win over. Our blog is our primary channel for communicating with screening professionals and stakeholders. Over time people have really embraced it and can now see for themselves how useful the articles are. We have had some lovely feedback over the past 3 years and are now one of the best read government blogs – so thank you all. To mark the occasion we are going to take you, our loyal blog subscribers, on a little trip down memory lane and remind you of some features you may have forgotten about. We have blogged on pretty much every screening topic you can think of over the last 3 years – from new screening videos, tales from the front line, to personal stories about the benefits of screening, such as Poo sticks saved my life. We have been delighted by the numbers viewing and sharing our blogs. Some have been around for a while, but continue to be well read. Our most read cervical screening blog post from 2015 is still very popular. 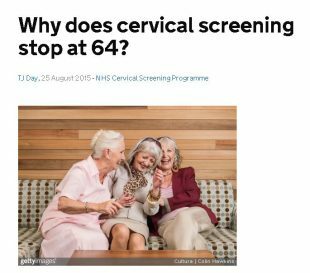 That is partly because if you use Google to ask the question ‘Why does cervical screening stop at 64?’, this blog article is the top result. With Google, popularity breeds popularity. But it is not always about numbers. 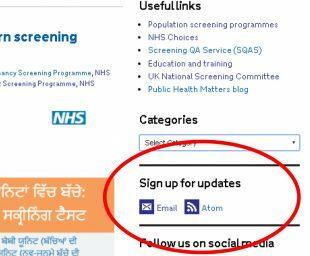 Some of our less well read articles are absolutely vital for their specific audience and the blog would not be doing its job if it did not publish these important updates of screening news. While I have your attention, here is a quick reminder of some blog features you may have forgotten about. The grey box at the top of the blog home page (right) shows a featured article we want to highlight for a while. Under that are all our published articles, with the most recent first. Each has a title, author, date and category. You can then read the first couple of sentences and see a picture, if there is one, to help you decide if you want to click on the link and read the whole thing. Each article is categorised by screening programme or general topic. To see all blog articles in a certain category, just make your choice from the drop down list under the ‘categories’ section on the right hand side. After reading a blog article you can submit a comment or question if you want but you certainly do not have to. Your name will be shown by your comment, but not your email address. We try to respond to comments as quickly as we can. To subscribe to our blog, click on the ‘email’ link under ‘sign up for updates’ (right). Then enter your email address and press ‘submit’. You will then get an email to notify you whenever a new article is published. The only drawback at the moment is that you will get emailed about all blogs but there may be some categories you are not interested in. Hopefully it is easy to just ignore any irrelevant notifications. In future, we hope you will be able to subscribe only to the categories you are interested in. We will be sure to keep you posted. 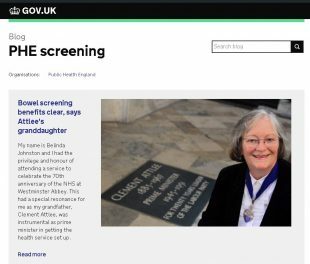 The blog is our main way of communicating with anyone involved in commissioning, providing or supporting the NHS screening programmes in England. So if you want to know what is going on, it really is the best place to look. We typically blog 3 or more times a week. If you have not already, do follow us on our dedicated screening Twitter account, where we regularly highlight interesting and useful blogs. You can always get in touch with ideas for blogs too. We would love to hear from you. Here's to the next 3 years and beyond!